In the first study of its kind in an animal species that has not passed a critical test of self-recognition, cognitive psychologist Justin J. Couchman of the University at Buffalo has demonstrated that rhesus monkeys have a sense of self-agency -- the ability to understand that they are the cause of certain actions -- and possess a form of self awareness previously not attributed to them. The study, which will be published July 6 in Biology Letters, a journal of the Royal Society, may illuminate apparent self-awareness deficits in humans with autism, schizophrenia, Alzheimer's disease and developmental disabilities. Rhesus monkeys are one of the best-known species of Old World monkeys, and have been used extensively in medical and biological research aimed at creating vaccines for rabies, smallpox and polio and drugs to manage HIV/AIDS; analyzing stem cells and sequencing the genome. Humans have sent them into space, cloned them and planted jellyfish genes in them. Couchman, a PhD candidate at UB, is an instructor at UB and at the State University of New York College at Fredonia. He points out that previous research has shown that rhesus monkeys, like apes and dolphins, have metacognition, or the ability to monitor their own mental states. Nevertheless, the monkeys consistently fail the mirror self-recognition test, which assesses whether animals can recognize themselves in a mirror, and this is an important measure self-awareness. "We know that in humans, the sense of self-agency is closely related to self-awareness," Couchman says, "and that it results from monitoring the relationship between pieces of intentional, sensorimotor and perceptual information. "Based on previous findings in comparative metacognition research, we thought that even though they fail the mirror test, rhesus monkeys might have some other form of self-awareness. In this study we looked at whether the monkeys have a sense of self agency, that is, the understanding that some actions are the consequence of their own intentions." For the study, Couchman trained 40 UB undergraduates and four male rhesus monkeys, housed in the Language Research Center of Georgia State University, to move a computer cursor with a joystick while a distractor cursor partially matched their movements. After moving the cursor, both humans and monkeys were asked to identify the computer cursor that they controlled -- the one that matched their movements and intentions. Both species were able to select the cursor they controlled from an array of choices, including the distractor cursor, at greater than chance levels. 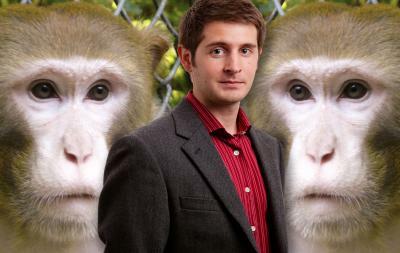 "This suggests that the monkeys, like humans, have some understanding of self agency," says Couchman. "This awareness or implicit sense that it is 'me' who is presently executing a bodily movement or thinking thoughts is an important form of self-awareness." Couchman says that because this is the first such demonstration of self-agency in a species that has not passed the mirror self-recognition test, the results may shed light on apparent self-awareness deficits in humans. "Mirror self-recognition is developmentally delayed in autistic children and absent in many who are mentally retarded, have Alzheimer's disease or are schizophrenic. It is not clear why this deficit occurs, but like rhesus monkeys," he says, "these groups may simply have biases against mirrors. "If, when studied, such individuals attempted to distinguish self-generated actions from partially altered actions in the paradigm reported in this study," Couchman say, "it might offer information as to whether the breakdown in their mirror self-recognition is due to a difficulty in processing certain kinds of perceptual or cognitive information." Decades of psychological research has established that the concept of agency implies an active organism, one who desires, makes plans and carries out actions. The sense of agency and its scientific study is significant in the study of social cognition, moral reasoning and psychopathology because of its implications for intention, consciousness, responsibility, desire and development. "Self agency also plays a pivotal role in cognitive development," Couchman says. "It is linked to metacognition, the first stages of self-awareness and theory of mind (understanding the mental states of others). These abilities give humans the sense that they are entities separate from the external world, and allow them to interact with other agents and the environment in intelligent ways. If rhesus monkeys are able to recognize themselves as agents that cause certain actions," he says, "then they probably have a similar understanding that they are entities independent from the environment."